I was enjoying my polar books the other night and came across a quote attributed to everyone's favourite humanitarian polar explorer and scientist, Fridtjof Nansen. Nansen is quoted in Fridtjof Nansen, his life and explorations, by James Arthur Bain, 1897. 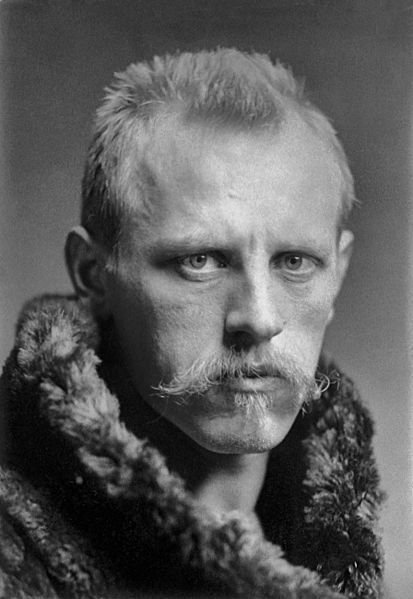 It's hard not to be in awe of Nansen. Posted in History. Tags: Arctic, DeLong, Fram, history, Jeannette, Nansen, polar on March 26, 2015 by Mark Brandon. In the old days Antarctica wasn’t mapped and measured by satellites like it is now. In the past it was all about exploration. 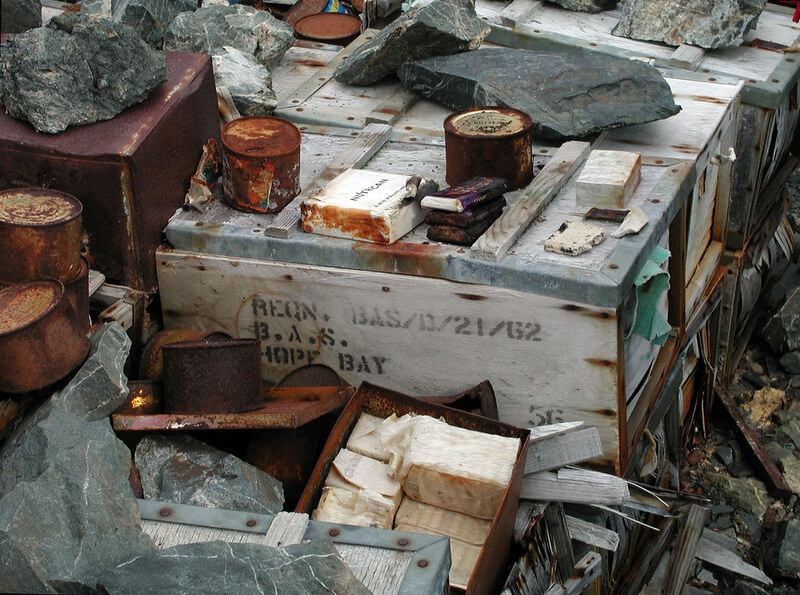 Scientists were dropped at bases by ship, and then left for at least a year - sometimes two. Very occasionally more. When winter comes the sea ice freezes up and the area of sea ice is vast. But after the winter, spring brings long days of light, and that meant travel by dog sled was possible over the ice! To make the sled journeys more efficient food caches were left along the coast the previous summer perhaps by the same ship that left them. 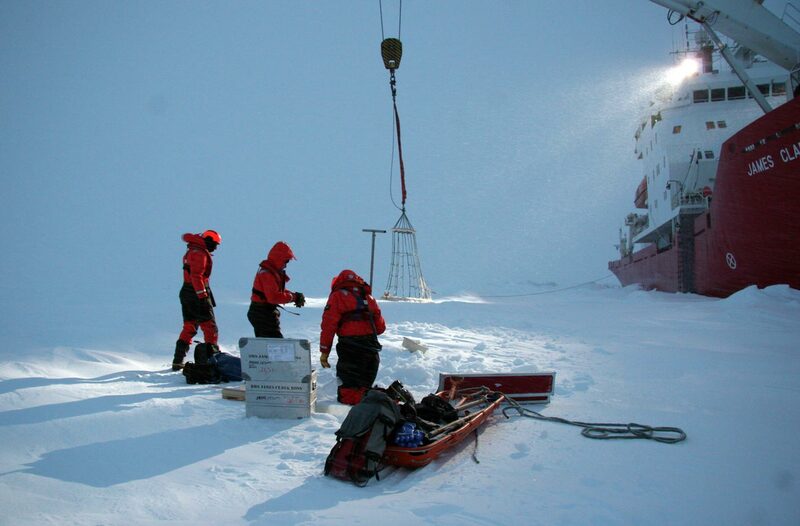 Then the scientists could journey easily over the frozen sea ice to the food cache, and then work inland in their area of operations. Which brings me to these pictures. 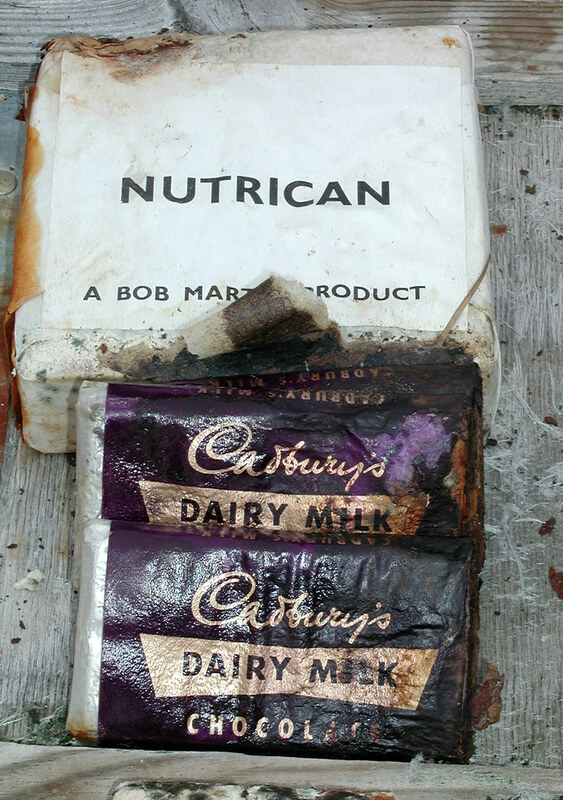 This is a food cache left by a ship (I think) in 1962 for a science team setting out from Hope Bay. 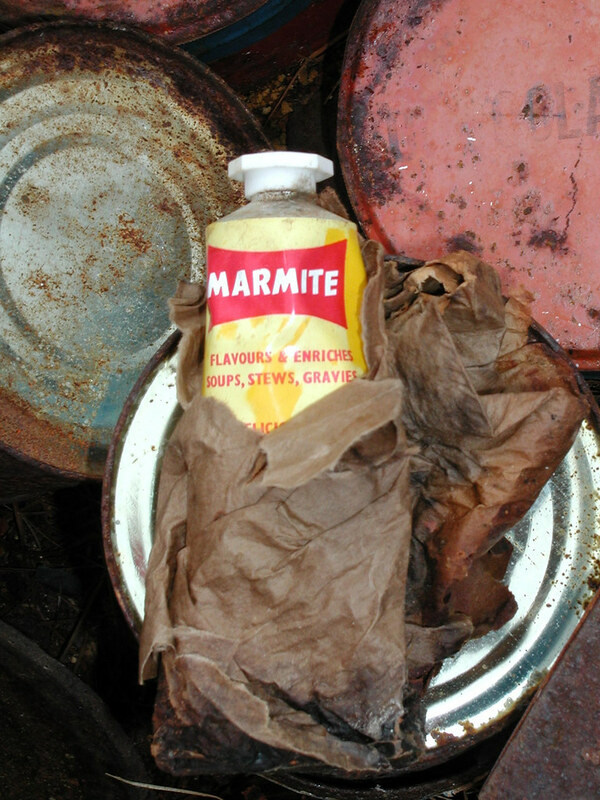 A pile of wooden sledge boxes that contain all human needs: chocolate, biscuits, marmite, meat and soup. What more could you want? Posted in History, Science. Tags: Antarctic Peninsula, Food, history, Hope Bay, polar on August 29, 2014 by Mark Brandon. This plot shows the Antarctic sea ice extent, the Arctic sea ice extent, and the total sea ice extent plotted against time. Like in previous post I chose 2012 only because it is the most recent complete year in this data set. Take a look at the minimum, the maximum and the range of the sea ice extent. The range of Antarctic sea ice extent is 16.37 x 106 km2, and the range of the Arctic sea ice extent is 11.88 x 106 km2. The Antarctic and the Arctic do not "balance" in sea ice extent - the Antarctic variations are much larger. Look at the shape of the annual cycle. I said previously that in the Antarctic the seasonal cycle of sea ice extent is not symmetrical. Sea ice grows slowly and steadily before decaying relatively rapidly: the melt period is shorter than the growth period. 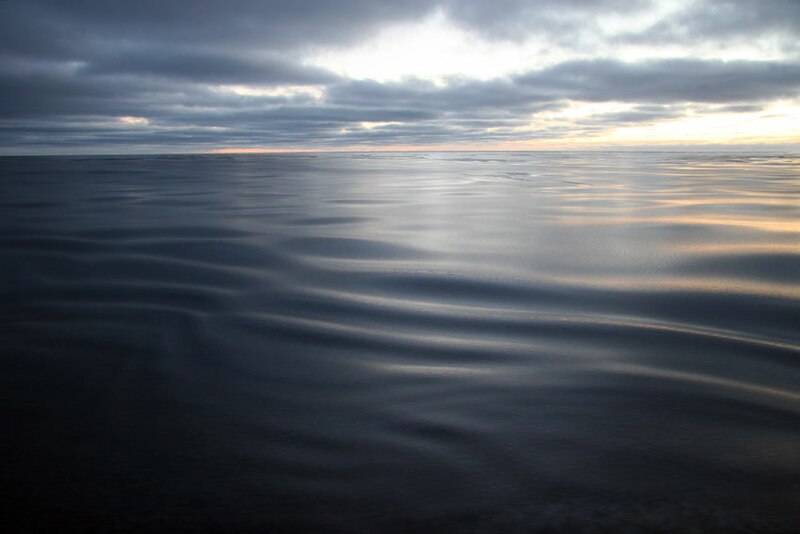 In the Arctic the time sea ice grows is roughly similar to the time sea ice melts. The annual cycle of the Arctic and Antarctic sea ice extent is very different. We know that the extent and thickness of the Arctic sea ice is decreasing. See for example what Tamino wrote in Feb 2014. But what about the Antarctic? The extent of the sea ice has broken records for the satellite era. (This is a very funny article making some claims about what that means - if you want a clue what is the difference between glacial ice and frozen sea water?). Some believe the observed reduction in the Arctic sea ice volume is balanced by the increase in the Antarctic sea ice extent. So we should look at the black line in the plot above. I will get onto why I don't think that is a good idea in a coming post. The data set is from the National Snow and Ice Data Center Sea Ice Concentrations from Nimbus-7 SMMR and DMSP SSM/I-SSMIS Passive Microwave Data. Posted in Science. Tags: Antarctic, Arctic, polar, satellite, Science, sea ice on June 2, 2014 by Mark Brandon. This is the 2012 sea ice extent for both the Arctic and the Antarctic. The day of year and the calendar day are at the bottom. I chose 2012 only because it is the most recent complete year in this data set. On 12 May 2014 we heard that for all intents and purposes the West Antarctic Ice sheet is doomed (here is the primary research which is open access). Then on 19 May 2014 we were told that Cryosat observations had shown that the loss of ice from Antarctica had increased quite a lot (here is the primary research). For excellent commentary on these stories you can visit Carbon Brief, or Antarctic glaciers.org. But whenever there is a big story about the decay of the West Antarctic Ice Sheet - which remember is land based glacial ice, some instantly point to this being not important because sea ice in Antarctica has been at record levels. People who suggest that the observed decrease in glacial ice is somehow balanced by the observed increase in Antarctic sea ice extent are wrong. The sea ice is generally only a couple of metres thick and it is telling us quite a different climate story. Over the next few posts I will try and explain why the decrease of Arctic sea ice is not balanced by an increase in Antarctic sea ice extent, and why there is no contradiction in glacial ice at the edge of the Antarctic continent decaying whilst simultaneously the sea ice is at record extent. The data is from the US Defense Meteorological Satellite Program (DMSP), and the data is freely accessible from the National Snow and Ice data Centre. Posted in Science. Tags: antarctica, Arctic, polar, satellite, Science, sea ice on May 22, 2014 by Mark Brandon. 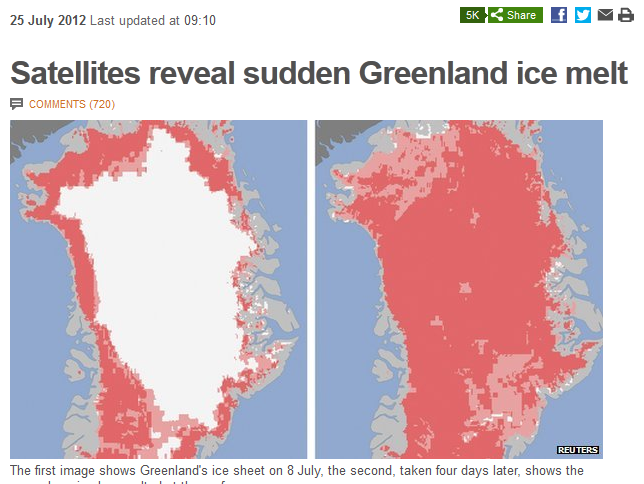 In 2012 I put together a storify using twitter and weblinks about the Greenland Surface Melt. In that story a bunch of climate scientists and I talked about whether the extreme melt seen in 2012 was a signature of global warming. 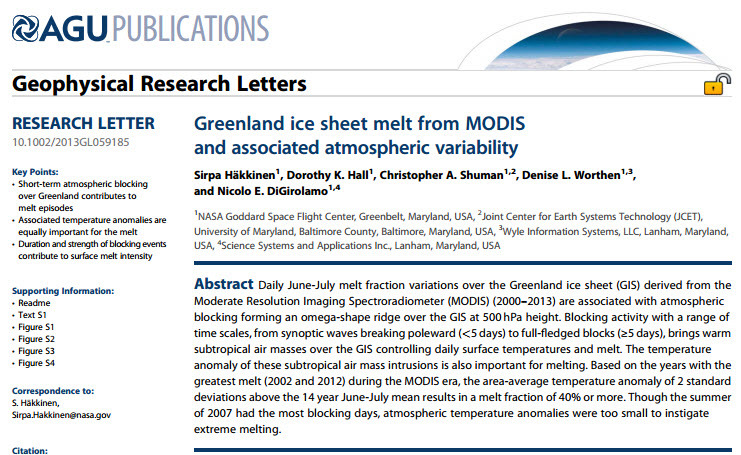 An Open Access paper by Sirpa Häkkinen and others Greenland ice sheet melt from MODIS and associated atmospheric variability, published on 10 March 2014, explains how it happened. It is a clear and well written paper that shows using MODIS (Moderate Resolution Imaging Spectroradiometer) data from satellites that you need two things for a serious surface melt event: atmospheric blocking (which allows warm air from the south to go over Greenland) + warm surface temperatures. The event in 2012 had both of those conditions whereas 2013 did not. The difference is striking in their Figure 1. Figure 1 From Häkkinen et al., 2014. 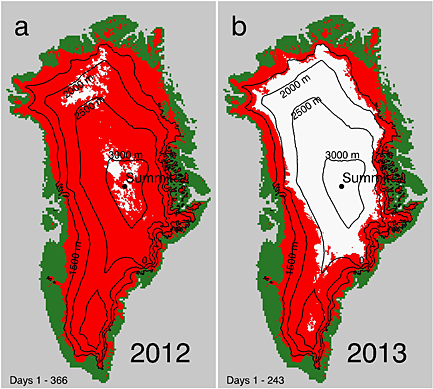 Extent of melt on the Greenland ice sheet for (a) 1 January to 31 December 2012 (days 1–366) and (b) 1 January to 30 August 2013 (days 1–243) as determined from MODIS-derived melt maps. A maximum of ~95% of the ice sheet surface (shaded red) experienced some melt in 2012 and only ~49% of the ice sheet surface experienced some melt in 2013. White represents no melting (according to MODIS), and green represent non-ice covered land areas. The location of Summit, mentioned in the text, is shown. Elevation contours are shown at 1500, 2000, 2500, and 3000 m.
Their data set allows them to go back to 2000 and construct annual time series. Tweet used in original storify. They find all of the features Ruth pointed out (shown in their Figure 4). "that June-July 2007 had the most blocking days but did not have the largest melt, although 2007 has been identified as a large melt year in a seasonal sense"
In 2012 the atmospheric blocking brought in "a long-lasting anomaly of 2–2.5 SDs [above the summer average temperature]". This is a bit bland but 2.5 SD's in this data set corresponds to temperatures ~6°C or greater above the summer average on the surface of Greenland. 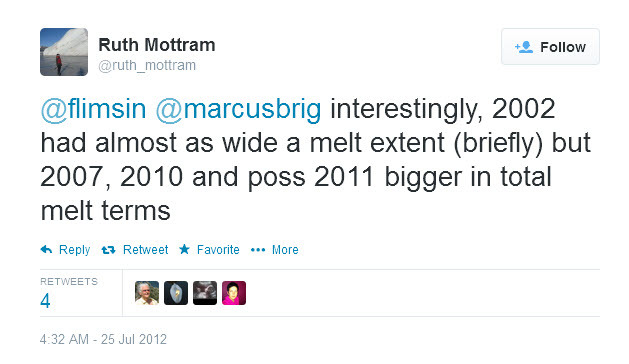 That is why the melt in 2012 was so large. Häkkinen et al. (2014) make no comment in the paper about the future, or the impact of anthropogenic climate change on such events over Greenland. Looking at various assessments of the scientific literature (e.g the Arctic Report Card) we may draw our own conclusions about whether to expect more of these melting events. Posted in Science. Tags: climate change, Geophysical Research Letters, Greenland, polar, Science on March 13, 2014 by Mark Brandon. It's very common to hear people harking back to the time when everything was apparently "better". Before the planet was "ruined", before anthropogenic climate change kicked in, and when everybody treated each other with respect. Of course I don't hold that view. Polar exploration had a golden age of sorts which is usually called the Heroic Age. 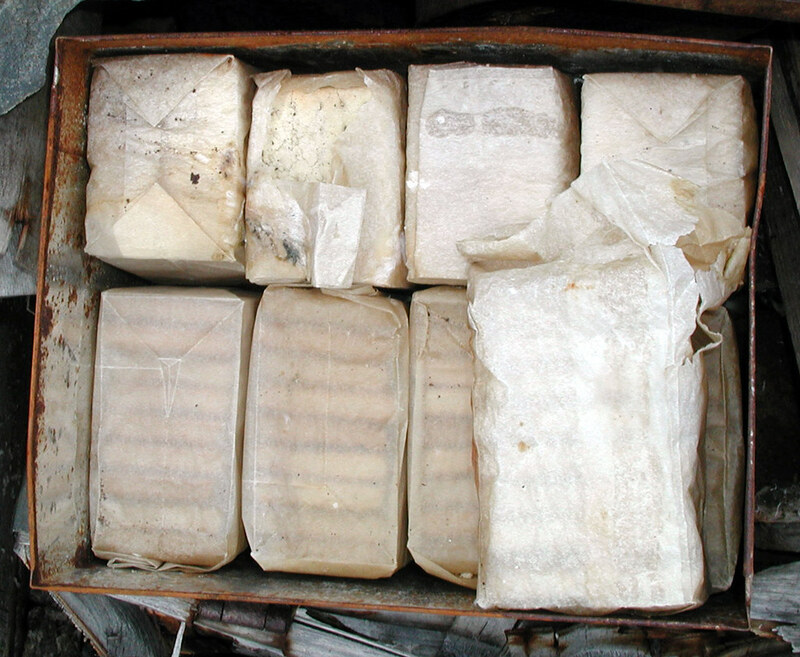 It covers the time period when explorers like Mawson, Shackleton, Speirs Bruce and Scott headed South. I am interested in the time period before that too. The British Library have put over a million images on Flickr. With that sort of resource surely there is something polar before the Heroic age? Searching on the term "Antarctic" throws up a vast number of results -and a couple immediately caught my eye. They were pictures drawn by one of my new favourite artists: the Scot William Gordon Burn Murdoch. Ever since I started researching and writing about the polar regions I have always been struck by how people seem to imagine them as some sort of "untouched wilderness". This image naturally caught my eye. Sealing by William Gordon Burn Murdoch. Source British Library Flickr Stream. Posted in History, Science. 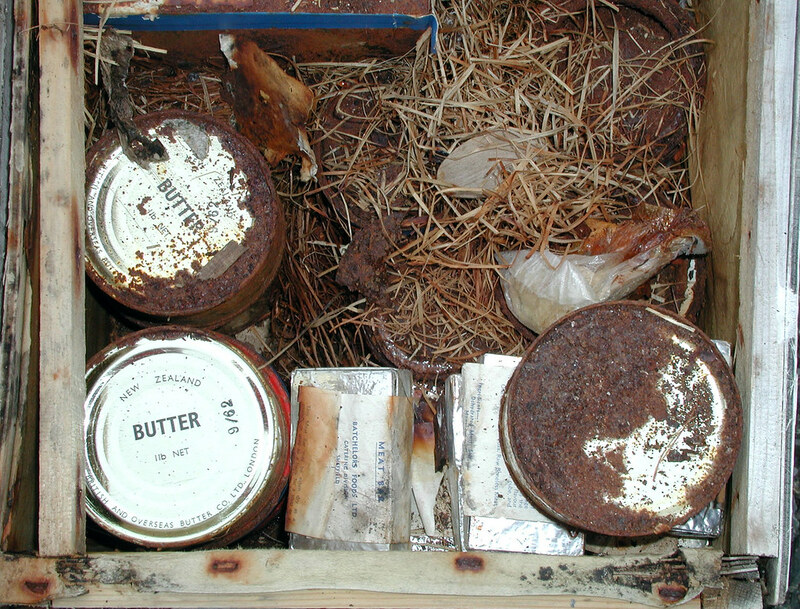 Tags: antarctica, Heroic Age, history, Mark Brandon, polar, William Speirs Bruce on March 11, 2014 by Mark Brandon. I came across this brilliant Deep Sea News blog post about oil on troubled waters. It talks at length about how a surface film of oil damps out higher frequency surface waves and only the low frequency waves can propagate. The net effect is the sea feels calmer as the breaking waves are damped out. The same thing happens in rough seas when ice forms. I took the picture below in Bellingshausen Sea. What you are looking at is very thin slick made up of sea ice crystals in the open ocean (called grease ice). The layer of crystals only allows the low frequency waves to propagate - so you see these odd looking slowly propagating ripples. Posted in Science. Tags: Antarctic, polar, satellite, sea ice on November 19, 2013 by Mark Brandon. Polar ice cannot be studied as other branches of science, philosophy, medicine or law are studied. The study of sea ice belongs among the most exhausting disciplines which have to be studied on the spot, in loco status nascendi et vitae, and which require strong men, absolutely sound in mind and body, courageous, willing and fit to renounce all comfort, thoroughly prepared both in theory for the work and ready to face all the hardships that may come like a bolt from the blue and in the most unfavourable moments. The sea-ice has to be studied far away, in the north or south, in white deserts of ice, where there is nothing, nothing else, no shelter no help; and where, on those vast plains in which the chasms of the sea keep tearing open and unsurmountable obstacles in the shape of mountains of ice keep piling up, the Lord only is with man. It is a quote from the beginning of Cryologia Maris by Josef Zukriegel, which was published in 1935 by the Geographical Institute of the Charles IV. University. All of what Zukriegel says is all true of course - except naturally lots of women do sea ice research as well. In fact if you look at the latest AR5 IPCC report, and chapter 4 which is on the cryosphere, you will see many brilliant women polar scientists in the reference list. Josef is a bit hard to track down for a Brit, but he does have an island named after him in Antarctica. If you look at the extremely useful gazetteer of the UK Antarctic Place names committee you can see it is actually in quite a hard place to get too. Posted in Personal, Science. 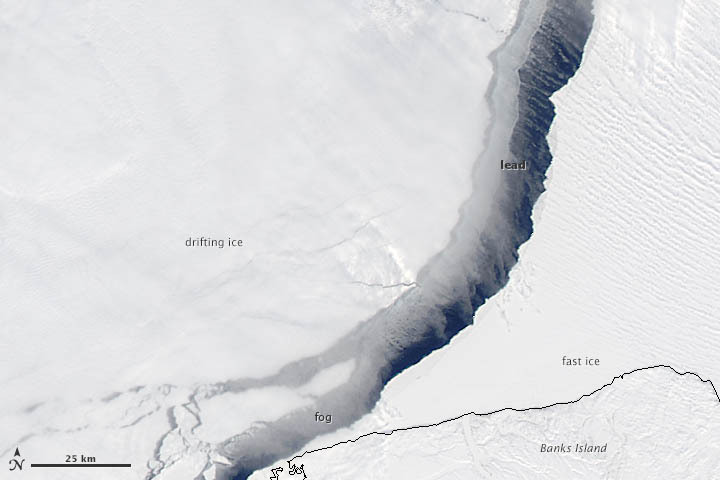 Tags: history, polar, research, Science, sea ice on September 30, 2013 by Mark Brandon. This post is quite long but stay with it. It shows how large some of the heat exchanges going on in the polar oceans can be. The picture above shows an iceberg through mist rising from the sea. I have talked before on this blog about how the sea ice moves, and how the International Arctic Buoy Programme provide some lovely movies of the buoy tracks which show this. I also pointed to Eric Larsen's video of the ice moving too. But what does this ice movement mean for the climate? As the ice moves it fractures, and the cracks extend over wide areas. These cracks are responsible for the "water sky" I talked about previously. A recent MODIS satellite image from the Aqua satellite posted at the NASA earth Observatory shows one of these cracks (we call them leads) opening up. From the scale bar on the bottom left you can see that the open water is ~18 km wide, and the lead is more than 100 km long. More than enough to get a ship through! Posted in Science. Tags: Arctic, climate, polar on June 12, 2013 by Mark Brandon. In March 2013 I was delighted to be asked to give a talk at TEDx Southampton. It was brilliant to be asked to speak, and really enjoyed the fantastically well organized day. Many thanks to the hardworking large team who put it together, and in particularly James Dyke,Alison Simmance and Jonathan Akass. On the TEDx Southampton YouTube channel for the event are some amazing talks from that day. Posted in Science. 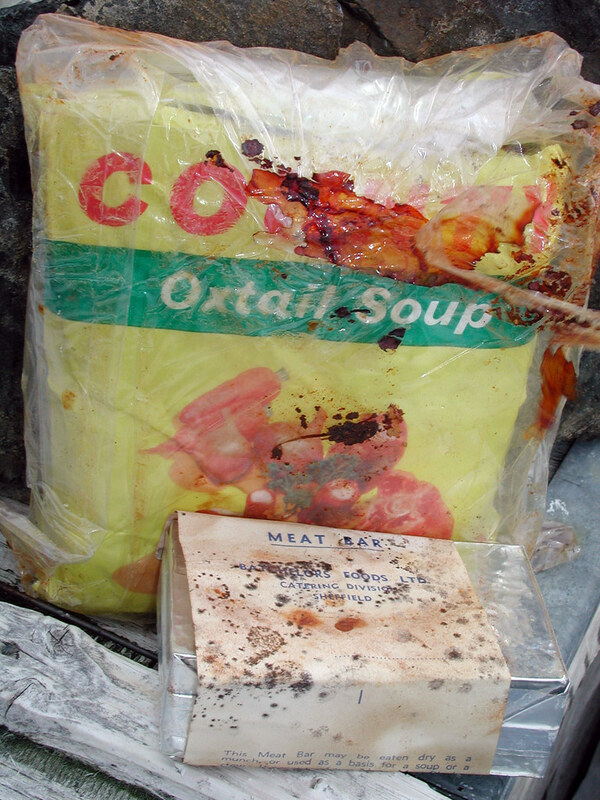 Tags: Antarctic, antarctica, Arctic, climate change, polar on April 25, 2013 by Mark Brandon.